Without a doubt, butter is one of the most popular spreads and food ingredients across the globe. However, not many people know that there is such thing as “clarified butter” or ghee. It is somewhat similar to butter (in fact, can be an alternative to butter in some recipes) but is used differently in so many ways. What’s the difference between ghee and butter? This article is for you. Ghee is a type of clarified butter that is produced by simmering butter on medium-low heat until the water evaporates and the milk solids separate. Once the milk solids turn brown, the molten liquid is then poured through a cheesecloth-lined strainer to remove the solid residues that rose to the surface and settled on the bottom of the pan. The result is ghee, a translucent liquid fat which is also called “pure butterfat” or “clarified butter.” Commercially sold ghee may have added spices for flavor. Because butter is toasted to make ghee, the liquid is usually a clear golden yellow. It also has a deep nutty flavor and sweet aroma. Many people prefer ghee over other types of vegetable oil because of its high smoke point (482°F) which means it does not burn easily. Moreover, ghee has a minimal water content so it has a significantly long storage life even without refrigeration. Ghee originated in India where it was used in religious rituals, traditional medicine, and cooking traditional Ayurvedic recipes. Today, it’s being sold in many countries all over the world and is primarily used for culinary purposes. It is perfect for sauteing, frying (deep frying and pan frying), baking, and cooking many recipes. Those who are suffering from lactose intolerance may consume ghee as it contains almost no dairy. Ghee has a high level of vitamin A, traces of vitamins D, E, and K, and butyrate, a type of fat that keeps your gut lining healthy. However, ghee contains a very high level of fat. On the other hand, butter is a dairy product that is produced by adding lactic acid producing bacteria to cream or milk and, sometimes, water. The liquid is then churned until it becomes an emulsion. Commercially sold butter may have added preservatives and artificial flavorings, like salt, garlic, and basil. Butter is usually pale yellow although some brands have deep yellow butter. It has a faint aroma and a distinct “buttery” taste which may be a combination of sweet, salty, and sour. It is in solid form at low temperature, turns liquid at high temperature, and softens and becomes spreadable at room temperature. It does not have a high smoke point (350°F) so it is not best for frying because food will get charred easily. It contains a high level of fat (typically up to 80% depending on the brand). Butter is a popular ingredient in baking, sauteing, and cooking, and it is also widely used as a spread on bread products. What, then, is the difference between ghee and butter? Ghee is a type of clarified butter, which means it does not contain milk solids and milk proteins. It is made by simmering butter and removing the milk residues leaving pure butterfat. Butter, on the other hand, is an emulsion of milk or cream. Commercially sold ghee may have added spices for flavor, while some brands of butter may have added preservatives and flavorings. In terms of appearance, ghee is a golden yellow liquid which has a sweet aroma and nutty taste, whereas butter is usually pale yellow with a distinct “buttery” taste and a very faint aroma. 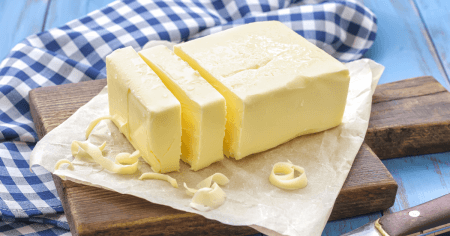 Butter can be solid or liquid depending on the temperature it is exposed to. Additionally, ghee has a higher smoke point (428°F) than butter (350°F). This means that it is great for frying, sauteing, baking, and cooking other recipes. Butter cannot be used for frying as your food will burn easily, but it is used as a bread spread, and is a popular ingredient in baking, cooking, and sauteing. Ghee also has a longer storage life than butter and does not even need to be refrigerated. Ghee may be safe for lactose intolerant people since it does not contain lactose, whereas butter should be avoided by those who are lactose intolerant because it contains dairy.